160 screenings, four positive findings, four lung cancer patients whose prognosis is much better than it would have been had they waited until they experienced symptoms or until later-stage disease was detected. These are the results, so far, of the new low-dose CT lung cancer screening program at Larchmont Medical Imaging. “The morbidity and mortality rates for lung cancer have historically been very high because the disease is usually not found until it has already reached an advanced stage,” said Michael Brodsky, M.D., a radiologist and fellowship-trained body imaging specialist at Larchmont Medical Imaging. Larchmont Medical Imaging, which is Burlington County’s largest diagnostic imaging provider and serves patients at locations in Mt. Laurel, Medford, Moorestown and Willingboro, also earned recognition last month by the American College of Radiology (ACR) as an ACR Designated Lung Cancer Screening Center. The practice is one of only four ACR Designated Lung Cancer Screening Centers in New Jersey and the only provider in Burlington County to have received this designation. Newly approved Medicare coverage also allows for screenings of patients up to age 77 if they meet the other criteria above. When the findings of a low-dose CT lung cancer screening are suspicious, patients are managed with protocols recommended by the NCCN, which vary depending on the size and characteristics of the lesions. For the smallest lesions, the protocols call for follow-up scans from three months to one year later to check for signs of progressing disease. For larger lesions, a biopsy or lung resection may be recommended immediately to confirm or rule out a cancer diagnosis. “Lung cancer remains a challenging disease, compounded by how difficult it is to break a cigarette habit,” Dr. Brodsky said. “But the research—not to mention the successes we’ve had with some of our earliest screening patients—points to the potential to make a significant difference and save more lives now and in the future. 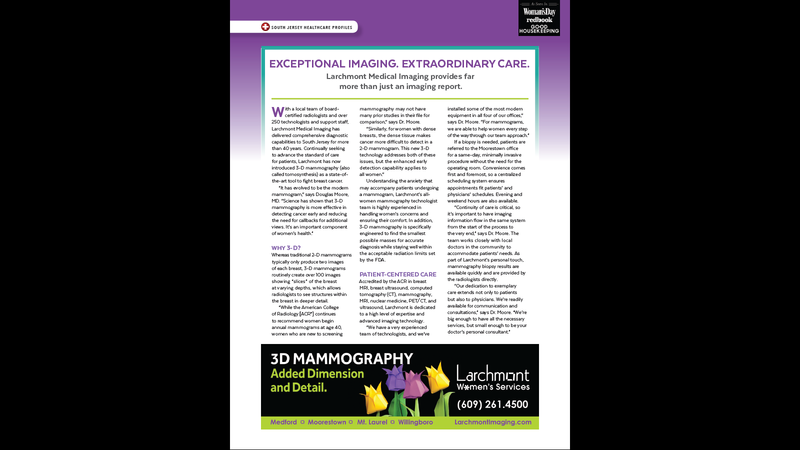 American College of Radiology, Society of Breast Imaging: "Annual Mammography Starting at Age 40 Still the Best Way to Save Lives from Breast Cancer"
I've always been impressed how friendly and efficient Larchmont Imaging is!! Was very pleased that I called for appointment and was seen within the hour. Staff was extremely friendly and helpful. I have always been treated professionally by Larchmont, but my experience last week was extraordinary! Your technicians were caring and awesome, and the doctor went above and beyond. Thank you so much!